In this guide, we’ll discuss the sleep challenges faced by shift workers, including shift work sleep disorder, and provide some tips and resources to help shift workers get a good night’s sleep. Many of us associate shift work primarily with hospitals, transportation, or blue-collar manufacturing.However, shift workers are also found in customer service call centers, 24-hour news operations, and security monitoring, to name only a few of the other around-the-clock operations involving shift work. Shift work is defined as work that occurs outside the traditional 9-5 workday. Shift work makes use of all 24 hours of the day by dividing them into set periods during which groups of workers perform their jobs–something our never-sleep society has become increasingly dependent on. According to the Bureau of Labor Statistics and the New England Journal of Medicine, 21 million Americans – as much as 20% of full-time workers in the United States – work on evening shift, night shift, or rotating shifts outside normal daytime schedules. The reasons people work shift schedules are as varied as the professions listed above. 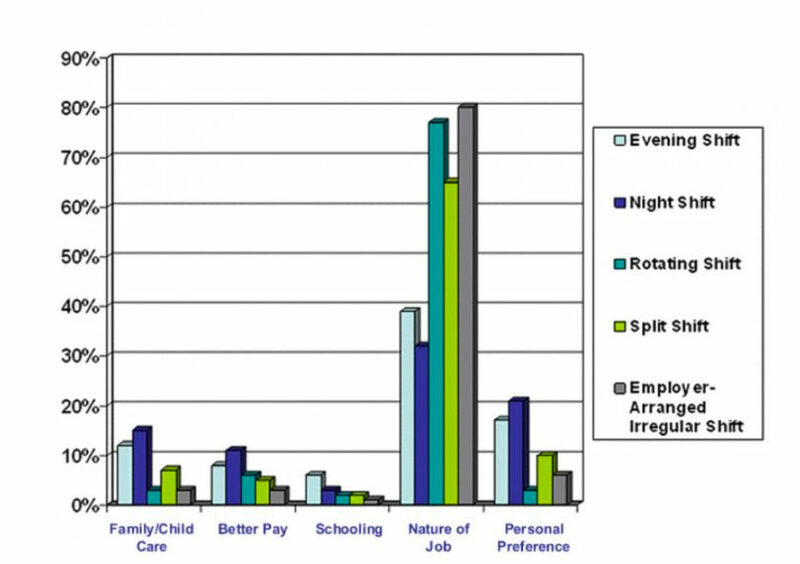 More than half of all shift workers report that they work an alternate schedule because the nature of the job requires it, but others choose to do so out of personal preference, to accommodate their children’s school schedules, to have better childcare arrangements, or because they could not get any other job. Interestingly, better pay was not frequently cited as a reason for choosing shift work although it is customary for employers to pay shift differentials or higher rates of pay to employees who work shifts other than regular weekday hours. What types of shift work schedules are there? There are dozens of schedules utilized in shift work but the two most common are multiple shift patterns and same shift patterns. Multiple shift patterns are ones in which a worker will rotate between the different shifts set up by their employer, taking equal turns at each. These rotations may occur every week or every few days and, based on extensive research, have the most significant impact on sleep patterns. Single shift patterns are ones in which workers are assigned to a certain shift and remain there over long periods of time. Most shift workers prefer the single shift pattern because they can better plan their family and social lives around a consistent work schedule. Shift work is vital to companies who are striving to meet the 24/7 demands of global markets as well as to citizens relying on around-the-clock services. But with shift work comes a multitude of challenges to the health and well-being of the workers. We are born with a biological clock that acts as a synchronizer of bodily functions during each 24-hour period, including when we sleep and when we are awake. This clock responds very strongly to light which is a cue for the body to know when it should be active. So, for shift workers, sleeping during daylight hours and being awake and alert at night creates a mismatch between the external environment and this internal clock. Only 63% of shift workers say they get enough sleep. Shift workers experience drowsy driving at least once a month, increasing rates of accidents. Shift workers have a 40% higher risk for heart disease than day workers. As many as 75% of shift workers complain of digestive problems. Chronic fatigue, chronic anxiety, and depression occur more often among shift workers. Higher rates of obesity and elevated cholesterol are documented in shift workers. Among smokers, the number of cigarettes per day increases with shift work. A higher incidence of breast cancer, miscarriage, preterm birth, and low birth weight occurs among female shift workers. Being awake at night is not a natural state for our bodies and, over the course of time, can take a heavy toll on our physical and mental health. Circadian rhythms are a critical part of our biological makeup. So critical in fact, that in 2007 the World Health Organization (WHO) actually classified any disruption to them as a carcinogen – a substance capable of causing cancer in living tissue. But what exactly are circadian rhythms? 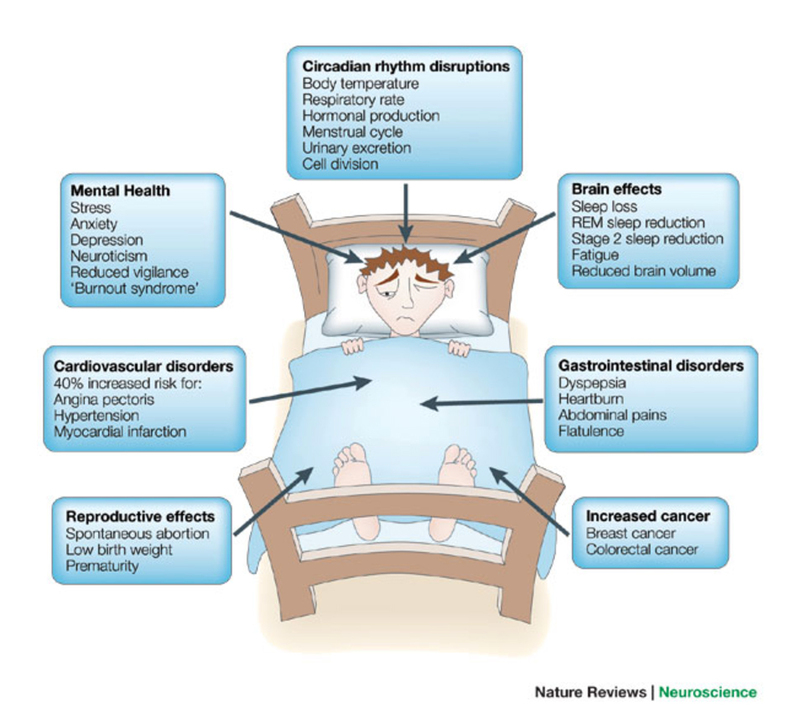 Circadian rhythms – regulated by small nuclei in the middle of the brain – are the physical, mental, and behavioral patterns of all humans (and most other living things) that follow a roughly 24-hour cycle. These patterns respond primarily to the light and the darkness in our environment and impact sleeping, waking, digestion, hormone production, cell regeneration, body temperature, blood pressure, pulse, and more. Normal circadian rhythms are coordinated for high levels of activity during the day and low levels of activity at night. When shift workers flip-flop this normal state, bodily rhythms get out of sync and struggle to adapt, resulting in fatigue, disorientation, and other serious health problems. While most adults seem to function best with 7 – 9 hours of sleep each night, each of us has subtle differences in when we sleep best and for how long. Everyone has heard the terms morning person and night owl but now scientists believe that these tendencies are determined, at least in part, by our genetics. Having a scientific basis for our preferences could explain why people who are early-to-bed/early-to-rise and people who stay-up-all-night/sleep-until-noon may struggle to change their sleep/wake behavior. Knowing which group you belong to will help you understand how you might adjust to shift work. If you’ve always been a night person, night shifts might work well for you, but if you’re at your best in the morning hours, you may struggle adjusting to the requirement to be energetic and productive at night. It might seem difficult to find something which doctors, police officers, factory workers, and office cleaning staff have in common. But despite the differences in their job duties and responsibilities, they share one thing – the impact of shift work on the quality of their sleep and their health. The effects of shift work on overall well-being are now so well-documented that the resulting condition was given the formal clinical name shift work disorder. This is a chronic condition directly related to a work schedule that is different than a traditional workday. Some of the most effective treatments are described below. Circadian rhythms are improved when workers are exposed to bright light for at least 6 hours of their shift when working at night. This is paired with wearing sunglasses on the way home even if outside light is still dim. Melatonin. A natural sleep aid, Melatonin is taken in doses ranging from 6mg to 10mg per day. Sedatives. By prescription only, the most common are Ambien, Lunesta, or Restoril. Stimulants. Stimulants can be as basic as caffeine or can be prescription level drugs such as Modafinil 200mg, the only drug currently FDA-approved for shift work disorder. Strategic napping. Brief catnaps of 20 minutes or less taken during a break in the early part of a night shift can help workers avoid drowsiness. Days off. Simple, yet effective, time away from shift work is essential. Avoid long commutes whenever possible. If naps are not your style, try to be active during breaks – take a walk or exercise for a few minutes. Drink a caffeinated beverage (coffee, tea, cola) to help maintain alertness. Don’t leave the most boring tasks until the end of your shift when you likely feel the drowsiest. Keep to the same bedtime and wake time schedule even on weekends. Eliminate noise and light from your bedroom (use eye masks and earplugs if necessary). Avoid caffeinated beverages in the 2 hours before bedtime. Avoid alcohol; while it may make you drowsy initially, it will disturb sleep during the night. 3:00 a.m. Take in your last caffeine by no later than 3:00 a.m.
One of the most important things shift workers can do to have quality sleep is to stay on the same general sleep schedule when not at work. Try to sleep from 3:00 a.m. to noon on your days off and shift your meals to slightly earlier times. Because each profession that involves shift work is unique, we have created a handy resource guide for each of the jobs below. Two distinguished organizations devoted to the study and improvement of sleep that have resources and tools for shift workers are the American Academy of Sleep Medicine and the National Sleep Foundation. Both have very large online resource libraries that are easily searchable. WebMD is an excellent resource for information related to shift work challenges, shift sleep disorder, and other issues associated with working outside normal daytime hours. HelpGuide, a collaboration with Harvard Health Publications, offers articles and information about everything sleep-related. It offers a host of articles and research information related to sleep disorders and sleeping problems that arise from shift work. A leading publisher of health, fitness, and food information that inspires or “sparks” people to live healthier lives is Spark People. Their website offers advice, tools, and a vibrant online support community related to wellness including how to stay healthy while working late shifts. Police One is a popular online resource for law enforcement and is devoted entirely to the safety and well-being of police officers. The articles and information on the site are generated by criminology and criminal justice experts as well as active and retired law enforcement. Harvard University has studied sleep issues among police officers specifically. The Police Policy Studies Council is a research-based training company that serves as a resource for active duty police officers and law enforcement professionals. They have provided training and consultative services to thousands of U.S. law enforcement agencies and over 30 countries outside the U.S.
Fire Rescue 1 is a robust online resource established to help firefighters stay safer on the job as they work to protect their communities. A top source of information for the fire and rescue community, Fire Fighter Nation serves firefighters worldwide and has content designed to give fire and rescue professionals information about a wide variety of issues and concerns. Firehouse Forums presents an ongoing dialogue online about issues of importance to firefighters including sleep deprivation and its impact on wellness. Fire Engineering magazine was established in 1877 and has been providing education and resources to fire and emergency services personnel ever since. Now online, the magazine’s content includes articles written by firefighting professionals and fire and rescue experts. The U.S. Fire Administration is a division of the U.S. Department of Homeland Security’s Federal Emergency Management Agency and its mission is to promote prevention and preparedness among firefighters and fire rescue personnel. While the Occupational Safety and Health Administration or OSHA is usually recognized as an organization that regulates industry and safety standards, it also conducts excellent research and publishes information related to the health and well-being of shift workers, including information about sleep loss and sleep deprivation. One of the most informative online resources for nurses is Nurse Together. There you’ll find articles, tips, and research related to all the issues and concerns faced by the nursing community. Another excellent source of information, including peer-reviewed clinical articles for both learning and teaching, is Nursing World. The site boasts a vibrant online community and provides extensive information about all aspects of the health and well-being of nursing professionals. Several government organizations devoted to enhancing health and reducing illness and disability, including the National Institute of Health, the Center for Disease Control, and the National Institute for Occupational Safety and Health, have excellent information specific to nurses and other healthcare professionals including information about sleep. A well-established and reputable source of information about sleep health for railroad workers is the Federal Railroad Administration, part of the U.S. Department of Transportation. The sleep issues related to rail work are so concerning that the National Transportation Systems Center (sponsored by the Federal Railroad Administration listed above) has established a website called Railroaders’ Guide to Healthy Sleep where there is extensive information for rail workers and their families. This resource is particularly noteworthy since it was originally launched in collaboration with the Harvard Medical School Division of Sleep Medicine. Established in 1883, Progressive Railroading is an organization that has done extensive research on rail worker fatigue and sleep loss. The study outcomes and plenty of related information can be found online. The National Safety Council has studied the impact of sleep loss on transportation workers in-depth for many years and publishes outcomes in their online Safety and Health Magazine. An online resource provided by the American Academy of Sleep Medicine, Sleep Education is a great source of reliable information about sleep patterns and improving sleep. A part of Airline Pilot Central, Airline Pilot Forums is an online resource dedicated to pilot health, general health topics related to flying, and health-related information provided by the FAA. Sharecare is an innovative online resource where you can establish a personal health profile and, based upon your profession and age, are then supplied with customized information from experts about how to improve your health. Sharecare has done extensive research in relation to pilot sleep patterns and how pilots can deal effectively with shift work disorder. The FAA offers a wealth of information and fact sheets on nearly every health issue impacting pilots. The Aircraft Owners and Pilots Association has a robust online community of pilots and air travel professionals and provides extensive information related to general health issues. The Center for Disease Control has a large number of feature articles related to the health issues faced by active military. Military.com was established in 1999 to serve the 30 million Americans who are working in the military by helping them stay informed on issues impacting their health. With 10 million active members, they are one of the largest military and veteran support organizations outside the government itself. Task & Purpose is a news and culture website geared toward veterans and soon-to-be veterans but also offers a host of information about the health challenges of active duty military personnel. The Real Warriors Campaign is a part of the Defense Department’s effort to encourage men and women in the military to seek appropriate care for health concerns. They offer particularly helpful information about sleep for deployed military personnel. The Service & Hospitality Safety Association (SHSA) is a non-profit organization funded by employers in the hotel, restaurant, laundry, and community service industries to provide education to employees who work in hospitality. It has great articles on how to deal with lack of sleep and its impact on work and home life. Hospitality Magazine is a publication exclusively for the hospitality industry and reports on trends and issues impacting both employers and employees. The American Academy of Sleep Medicine (AASM), established more than 30 years ago, is the only professional society dedicated exclusively to the subspecialty of sleep medicine and has extensive resources related to sleep loss among healthcare professionals. An outgrowth of the AASM, Sleep Education is an online news site devoted to disseminating information related to all the various sleep disorders including how to manage and treat them. The National Center for Biotech Information is an excellent resource for finding publications related to health issues including those that deal with sleep disorders as a public health problem. While most physician specialties are, to some degree, impacted by sleep loss, emergency room physicians may suffer the most since they routinely work during the night. As a result, the American College of Emergency Physicians focuses intensely on how sleep loss impacts physicians including how to deal with less than optimal hospital schedules. You must put in your email address and a few basic pieces of information to participate in Tech Target, but then you gain access to a large library of resources and articles, including tips for working call center and customer service night shifts. SPI-Global is one of the largest business process outsourcing companies in the world (providing call center services to some of the largest retailers in the U.S., for example), and they publish pertinent information about health issues faced by night workers in various customer service and call center jobs. A leading blog and podcast exclusively for the security guard industry, SilverTrac provides great tips for and articles on staying awake during late shifts. The American Society for Industrial Security, founded in 1955, establishes standards and guidelines for the security profession and is a leading information resource for security professionals. Security Management is an award-winning publication of ASIS International devoted to the professional development, education, and safety of security workers. In addition to the resources for specific professions noted above, the following are important sources of information for all shift workers. An entire organization dedicated to improving health and well-being through sleep education and advocacy, the Sleep Foundation remains one of the best resources for all things related to sleep, including sleep hygiene or the habits and practices that are conducive to sleeping well on a regular basis. Founded by sleep professionals, The American Sleep Association has excellent tips related to sleep hygiene and other sleep-related topics. Renowned Harvard Medical School has included information on their website about how to practice good sleep hygiene based on the results of their most successful sleep studies. If you have or believe you have a sleep disorder, you can get more information and find out where to seek medical help at the National Sleep Foundation. Sleep Education is an online resource provided by the American Academy of Sleep Medicine where you can find extensive sleep disorder and sleep health information. See our comprehensive guide to Sleep Disorders. The Sleep Cycle downloadable app uses your smartphone to monitor your movements while you sleep and then gives you a detailed assessment of how many times you wake up, how long you spend in deep sleep (REM), and whether you might have sleep apnea. SleepRate is another piece of technology that will give you detailed information on how you slept but it also records sounds in your bedroom so you’ll know if and when noise disturbed your sleep. It also includes a program licensed from Stanford University that will improve your quality of sleep. The Sleep Genius app, developed by neuroscientists for astronauts, goes beyond tracking details of how you slept and actually helps you fall asleep with pink noise (a softer version of white noise). Pink noise triggers a sensation in your brain that is like a baby being rocked to sleep. LIFX is a Wi-Fi enabled, multi-color, energy-efficient LED light bulb that you control with your smartphone. The color options include light purple to slow down your heart rate and relax you, deep red to help you sleep, and light orange to help you wake up in the mornings. Another feature helps you wake up naturally each morning by gradually increasing light. Instead of waking you up with shrill beeping like most alarm clocks, the Philips Wake-Up Light Plus gets you going gradually by imitating the soft light of sunrise, based on the scientific principle that our bodies release chemicals and start the process of waking up when the sun hits our eyelids. According to the National Sleep Foundation, noises at levels as low as 40 decibels or as high as 70 decibels can keep us awake. That means a dripping faucet can prevent you from sleeping just as much as your noisy neighbor. The Sleep Infuser is a sound conditioner (proven to promote sleep by muffling distractions with constant white noise) that masks sounds but also puts out a series of low pulsing hums that lead the brain into sleep. Developed by a Harvard Medical School professor, NightWave syncs your breathing to gently pulsing blue LED lights. As the pulsing gradually slows down, you are taken into a relaxed pre-sleep state and then can drift off. For more sleep apps, check out our Top 100 Sleep Apps. You can get information about how shift work affects sleep, as well as where to seek medical help for sleep disorders brought on by shift work, at the National Sleep Foundation. UCLA has a dedicated sleep center that has done extensive research related to the impact of shift work on sleep. The National Center for Biotechnology Information has several articles directly related to how shift work impacts sleep and what can be done to diminish that impact. 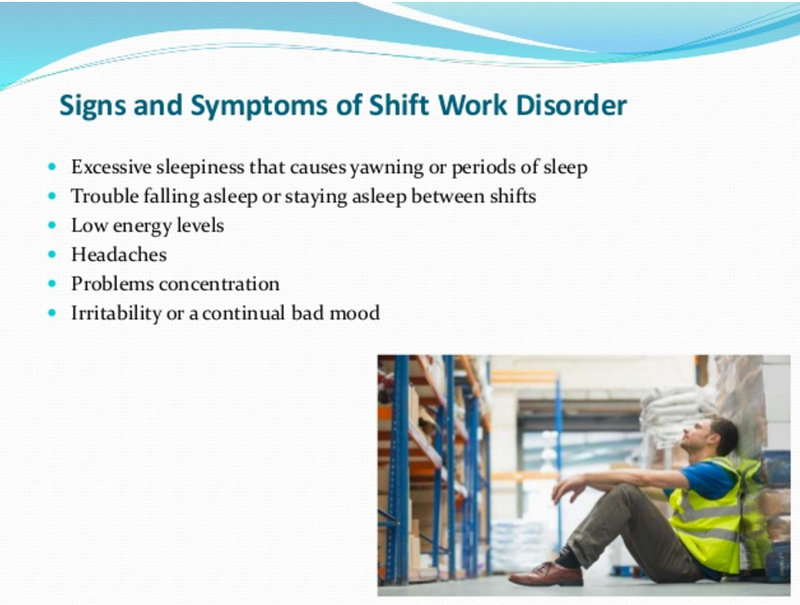 A resource provided by the American Academy of Sleep Medicine, Sleep Education is an excellent place to get key information about shift work disorder. The National Sleep Foundation has compiled and published information that will help you understand shift work disorder and live and cope with it successfully. Well-known medical resource, WebMD, provides easy to understand information about shift work disorder along with treatment options. A resource that has been cited previously but that bears repeating is Sleep Education. They provide a simple overview about insomnia and then extensive facts about its causes (including shift work) and how to deal with it. Well-recognized and respected for its research on a wide variety of health issues, the Mayo Clinic is a source for in-depth information about the basics of insomnia as well as treatment options. For a simple and easy-to-understand overview of insomnia, also check out Harvard, who includes insomnia and other sleep disorders in its vast library of articles on medical conditions and diseases.